It was a beautiful day so we decided to take a hike on the Palm Canyon trail at Kofa Wildlife Refuge just outside of Quartzsite. 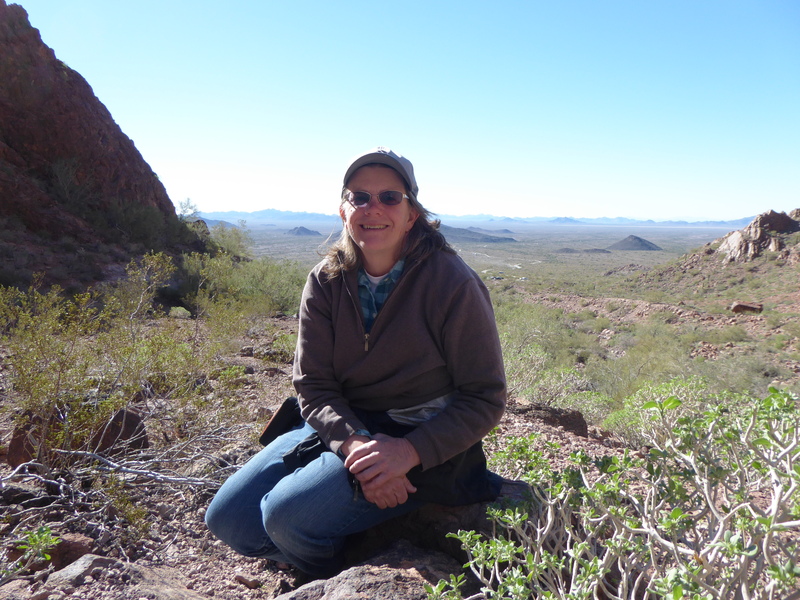 The refuge has over 664,000 acres of desert land and it was primarily established to protect the desert bighorn sheep, but also has mule deer, cottontail rabbit, quail, fox and coyote. The Palm Canyon trail is a rocky, steep trail that leads to a viewpoint where you can observe the California fan palms. 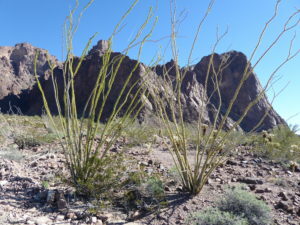 This is the only native palm species in Arizona. 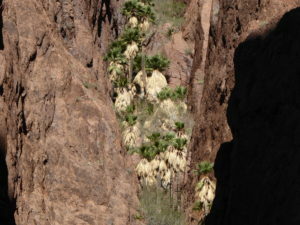 The palms sit up high and are deep set into the canyon. These palms only get a couple of hours of sunlight a day. We were lucky to be there just at right time to see them basking in the sun. California Fan Palms nestled in the canyon walls. 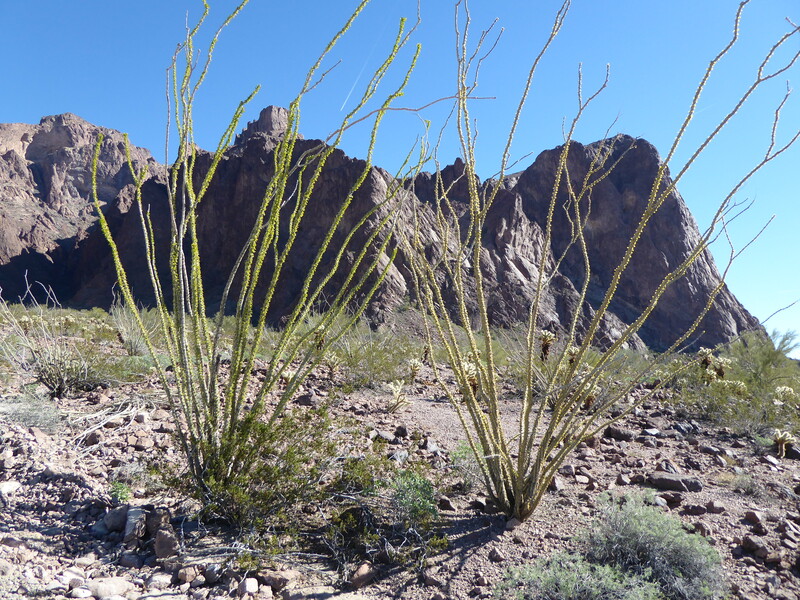 Here is a picture of some Ocotillos that we saw on the hike. During the spring bloom they get pink flowers on the tips. 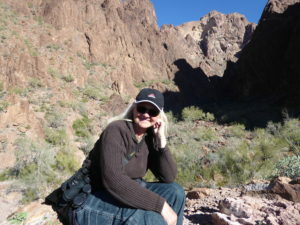 The hike was a half mile up to the canyon and the trail was somewhat steep and rocky. The loosely packed rocks made it slippery at times. Enjoying a break while taking in the views. It’s a beautiful day for a hike! 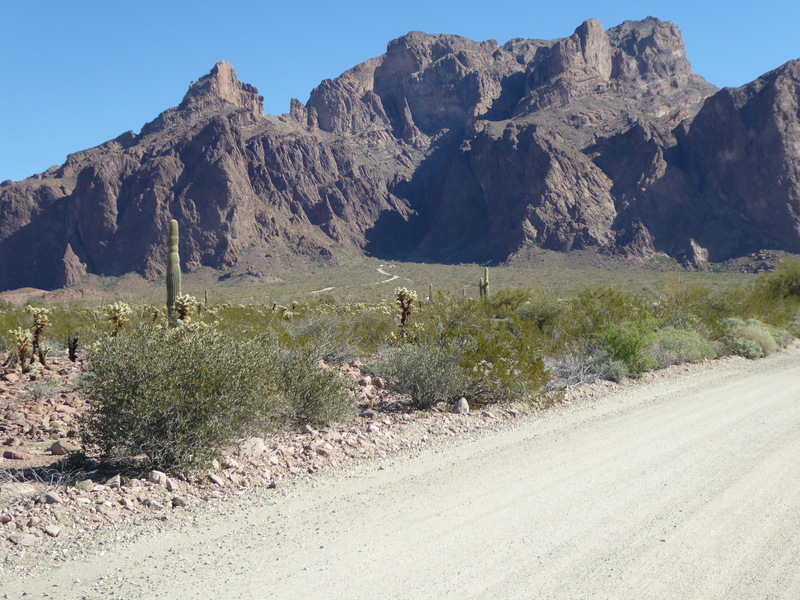 Our stay at Quartzsite was just over two weeks and we decided it was time to pack up and head south. 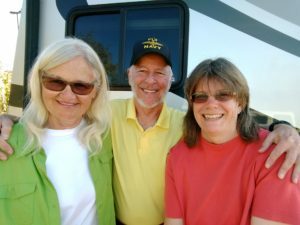 Our destination was the Fortuna De Oro RV Resort in Yuma. At the RV show they were giving out coupons to stay for 3 nights free and we decided to take advantage of it. 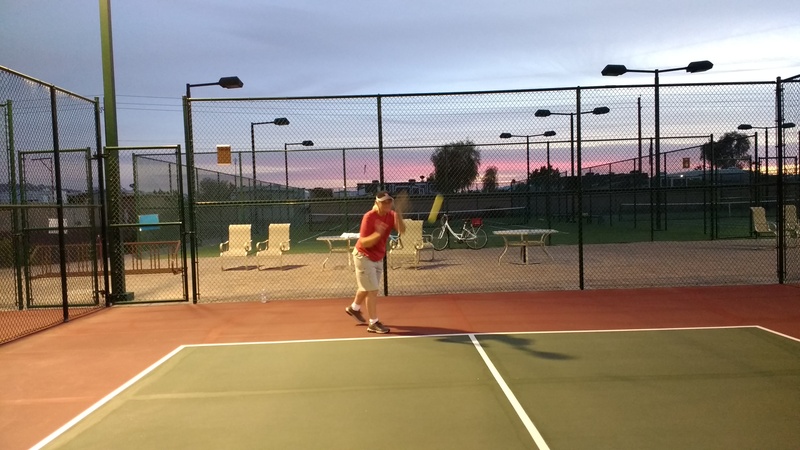 The over 55 RV resort has a ton of amenities and activities available for the residents and guests. We went to the pool and listened to live music and enjoyed happy hour, which appears to be a daily event. Heidi enjoyed the doggie park. 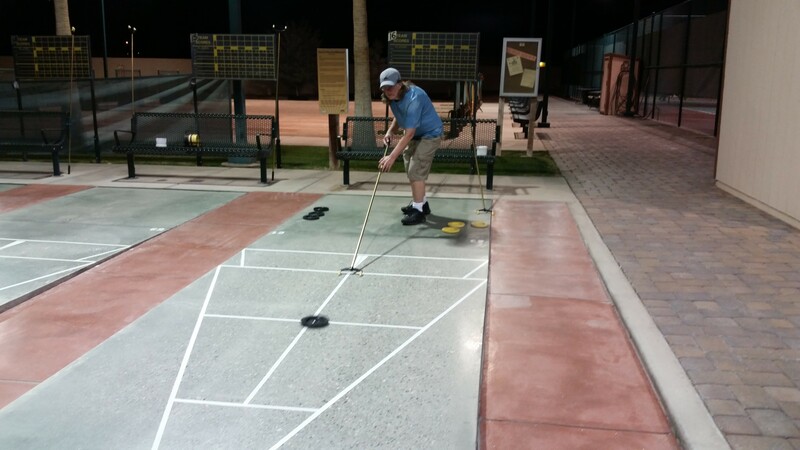 There were tennis courts, pickle ball courts, shuffle board courts, bocce ball courts and horse shoe pits. There was also a 9-hole golf course and a full service restaurant on the grounds. We rode our bikes here quite a bit while exploring the very large resort. Next stop – the sports complex where we tried a couple of new activities. 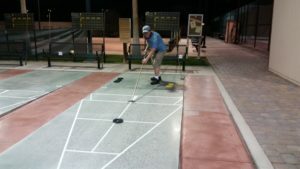 First time ever playing shuffle board! 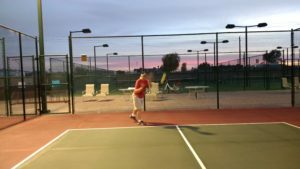 First time ever playing pickle ball! Our friend Gordon from Erie, PA was driving from Florida to California. He just happened to text us to see if we were anywhere near and as it turned out we were! Our move to Yuma made it so that we were right on his route. He came by for a visit and then we all went out to an authentic Mexican dinner. It was a great meal and really fun to catch up on all the happenings. We even got to see pics of the new granddaughter, Amelia Margret. Thanks Gordon for a delightful visit and meal! It’s a date.…it’s a shake….it’s a date shake! Our new friends bragged about the date shakes on route to Yuma and said we had to try one. We saw a sign, Martha’s Gardens – Yuma’s best date shakes. The store is located on an actual working date farm. 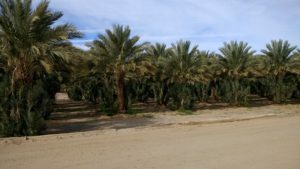 There were rows and rows of hundreds of date palm trees. Yes the date shake lives up to its name. It was yummy. If you ever get a chance to try one, do so! The few days in Yuma allowed us to get caught up with a few things such as laundry, stocking up supplies, scheduling bills online and a few minor repairs. We were very impressed with the over 55 community. They certainly know how to have fun and relax. The neighbor across the street must have been popular because we observed numerous guys knocking on his door throughout the day and hearing his wife telling them he must at Larry or Johnny’s…..it reminded us of childhood friendships – can you come out and play! Now it’s time to move on to our next adventure. We’re heading to the desert again. So stay tuned! This entry was posted in Arizona and tagged date shakes, Fortuna De Oro, Kofa, Yuma. Bookmark the permalink. I am enjoying your blog. Sounds like you are having a wonderful time! 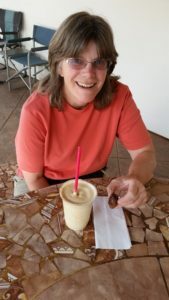 I had a date shake in California once and it WAS yummy! You guys are looking young, travel must agree with you. Hi Amy- We Agree! Hope you are having fun as well! We have been sampling Mexican food lately. Linda, you look better in these pictures than I have seen you in years! It is awesome to meet new friends, but still almost as good to see old friends! Have fun, be safe and enjoy! You two are doing it right! I so enjoyed our reunion in Yuma…such a neat, unplanned surprise! Your photographs are beautiful…thanks for sharing this Blog!